A self-assessment to gauge the effectiveness of your spreadsheet based GRC program. Designed to help those organizations using spreadsheet-based GRC. 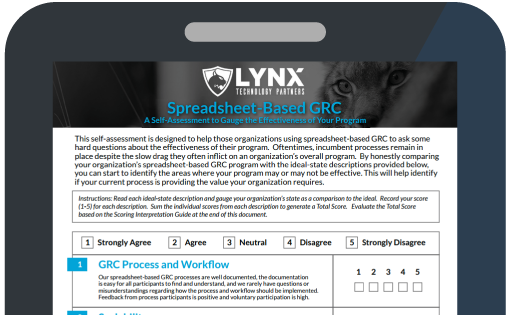 This self-assessment is designed to help those organizations using spreadsheet-based GRC to ask some hard questions about the effectiveness of their program. Oftentimes, incumbent processes remain in place despite the slow drag they often infl ict on an organization’s overall program. By honestly comparing your organization’s spreadsheet-based GRC program with the ideal-state descriptions provided below, you can start to identify the areas where your program may or may not be effective. This will help identify if your current process is providing the value your organization requires.